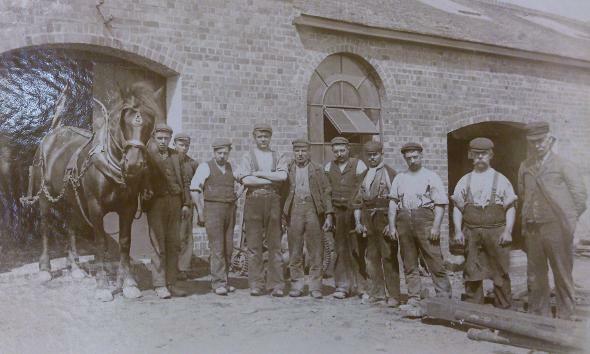 A photo from Stanley's Pit c.1900's Samuel Jones is second right and worked as a farrier, moving to Haunchwood Road from Willenhall, Staffordshire. He is dressed for work with a farriers apron on. Donated to Nuneaton Library by his son Lesley Jones. Nuneaton 'Old' Colliery has long gone and the site is now occupied by the estate behind the Cherry Tree Pub, but at one point it had hundreds of local people above and below ground 'working' the coal seams and collecting thousands of tonnes of coal for Stanley Brothers. Before Stanley Brothers got their hands on the land. It had been worked by Heath, Chadwick and Co from 1864 to 1870 and there are notes of a pit back as far as 18th century. 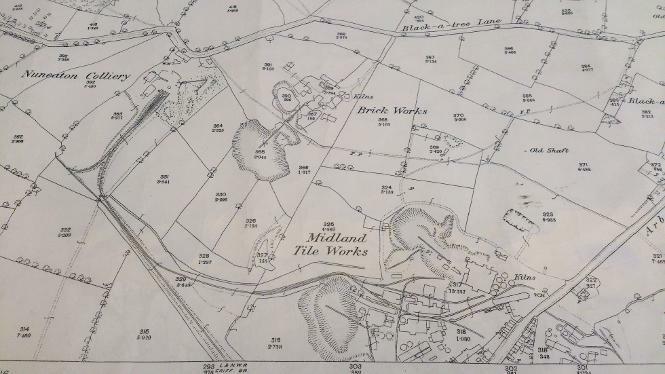 When the property became available for sale/lease, it had 'a clay pit of the finest quality, arable meadow and pasture land, various drying sheds, a brick built foreman's cottage, seven ovens along with an office and two coal shafts about thirty yards deep, all on twenty six acres of land'. As you can read it mentions a brickyard which became another site for Stanley's (No3 yard) with access to the excellent local clay (see map below). 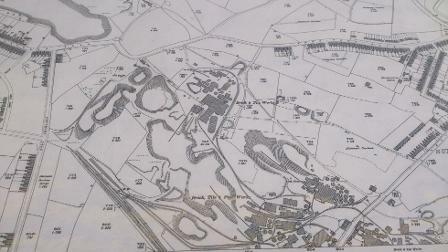 Two maps of Nuneaton 'Old' Colliery the first is before Westbury Road. Look at the kink in Tomkinson Road at the top of the map, I'm glad they got rid of that. Note that both photos have very little houses. The whole of this map today will be covered apart from a little of Vale View, top left corner. The bottom shows the Brickyard on Croft Road and how it slowly merges into one massive site. 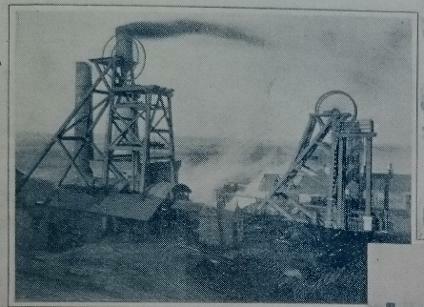 A photo of Nuneaton Colliery, but is it the old one.... that's the question! Nuneaton Colliery was a big investment for Stanley Brothers, the biggest project they had taken on so far. They had tested the water with a small pit in Croft Road and could see that all good brickyards had a supply of coal. The Colliery needed people experienced in mining. Im not sure if they approached Mr William Standley to be manager or he spotted them but he was charged with making the pit turn a profit. William was born in Wednesbury, West Midlands. His father George Standley was a local greengrocer. In 1871 William aged just nineteen had already taken up a position as a Mine Surveyor. He was gaining a reputation in the mining industry and was earning a good living out of this highly skilled career. He was soon to make Nuneaton his home, moving into 64 Dugdale Street with his wife Elizabeth around 1885 and set about his work. 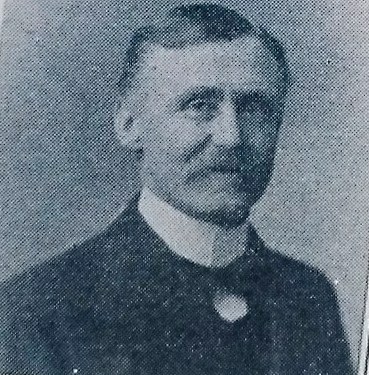 The Under-Manager was Joseph Hutt (right) who lived on Swan lane and had worked his way up through the company. He started as a miner and became William's right hand man having the privilege of living at 'Colliery Cottage' just a stones throw from the yard. Figures show that during the time the pit was 'worked' it had about 240 workers underground and around 70 on the surface. Reginald had already made moves to open a new pit close by in Whittleford and after the share issue could afford to move all the workers over to the 'New' Colliery on Whittleford Road and continue coal extraction.